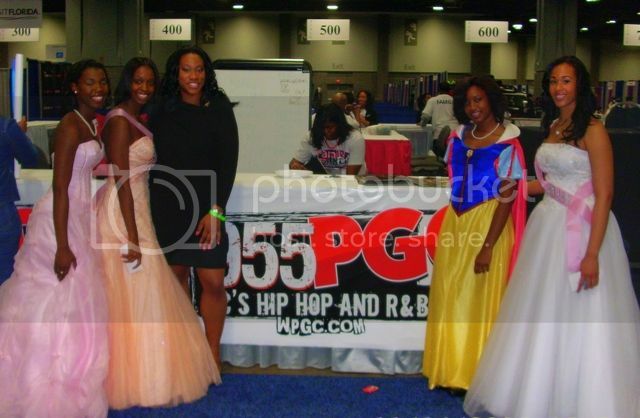 Ebonirose Wade, Founder, Rosa’s Doll House (3rd from left) and Dolls at the WPGC 95.5 "Family First" and Howard University "Community Day" event in Washington, DC earlier this month. Next month, the movie ‘The Princess & the Frog’ will open in theaters nationwide featuring Princess Tiana, the first Disney princess that is African American. But ten years ago, a then 15-year old Nashville teenager who was volunteering at her local day care center saw the need for African American children’s entertainment characters - and decided to do something about it. Ebonirose Wade founded Rosa’s Doll House in 1997, a children’s entertainment company that provides African American entertainment characters for children’s parties, functions and more. The company now successfully operates in Tennessee, South Louisiana, Chicago, New York, Northern Virginia, Maryland and Washington, D.C. Ebonirose is an avid reader of BlackGivesBack and shared her story with me! In 2002, as an extension to Rosa’s Doll House, an enrichment initiative was established for young ladies throughout Louisiana and Nashville, Tennessee, utilizing female university students and community leaders. The purpose of the initiative is to build positive self-esteem, morals, and character among African-American females ages five to fourteen. Through mentoring, community outreach, and self-awareness activities, the interventions will enhance, strengthen, and support their academic skills in order to help young women appreciate who they are by providing young, professional, collegiate minority women as role models. The overall goal of Rosa’s Doll House is to assist our African American young women in their development in becoming strong viable members of society. Today, Ebonierose is a 25 year old doctoral student at Howard University in Washington, D.C. and upon finishing her degree; she has plans to open a finishing school for young African American girls in Nashville, Baton Rouge, Louisiana, Washington, DC and New York. Ebonirose received her undergraduate degree from Southern University Agricultural and Mechanical College with a Bachelor of Science degree in Sociology and a minor in Business Administration. She received her Masters Degree from Howard University, where she served as a Graduate Assistant in the School of Education, and also served as a Howard University Middle School of Mathematics and Science intern, and Go-Girl Howard University Chapter Mentor. Visit the Rosa’s Doll House website at http://www.rosadollhouse.com/ to learn more about scheduling Ebonirose as a motivational speaker and to make your child’s party a memorable one!